For the past few years our school has sent a note home at this time of year, asking us not to buy gifts for the teachers at Christmas. In many ways I see the sense in this and understand why they do it, but I think it’s important for our kids to be able to say ‘Thank You’ and to get used to giving as well as receiving. There are lots of ways to do this. We pick some toys that the kids are not playing with anymore and donate them to a charity. Another thing we like to do is to make some edible gifts. These are great for neighbours, unexpected visitors, parents you carpool with and also the teachers. We get really stuck in and make festive labels and use Chistmas ribbon to make them special. 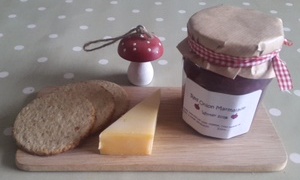 Here is my favourite recipe for Red Onion Marmalade – really great with cheese and Christmas dinner leftovers. It needs about 3 weeks in the jar so if you make it now, it will be perfect for Christmas. 1. In a large pot place the onions and the melted butter over a high heat. Stir the onions to prevent them from sticking. 2. As the onions begin to colour and soften (after about 5 minutes) add in the dark brown sugar and continue to stir. The sugar will begin to soften and will coat all of the onions. Allow the mixture to come to the boil gently. 3. Add red wine and red wine vinegar. Let the mixture to come back to the boil and then simmer, stirring occasionally, for about 15 minutes or until all of the liquid has evaporated off. 4. Keep stirring occasionally to prevent anything sticking to the base of the pot. 5. Transfer to clean sterilised jars and store for up to 3 months. If you enjoyed this recipe let me know how you get on in the comments below.